Xi'an, China, December 26, 2018 – The awareness of using herbal and natural products is growing among the humans, and MIGU is behind this growing trend. The company supplies a whole range of herbal extracts that come with medicinal values. These herbal products can simply boost one’s immunity and can also play a great role in the prevention of cancerous tumors. One can check the large portfolio of herbal products that MIGU Adaptogen Bio-tech Co., Ltd maintains and can pick the right product to help boost their health and energy levels. MIGU Adaptogen Bio-tech Co., Ltd has been supplying the ganoderma lucidum spore oil for quite a time now, and the product is now quite popular among the health conscious masses around the world. This oil is extracted from the tiny pores of the ganoderma mushroom using the super-critical extraction technology. The mushroom has been used since ages for its unique health benefits, and now MIGU supplies the ganoderma spore oil, which is a lot more convenient to consume on a daily basis. According to some research, the ganoderma mushroom has more than 400 bio-active ingredients, which can offer several kinds of health benefits for humans. The spore oil can work as an anti-cancer agent and can benefit patients undergoing chemotherapy. It can reduce hypertension and promote healthy blood sugar levels in the body. 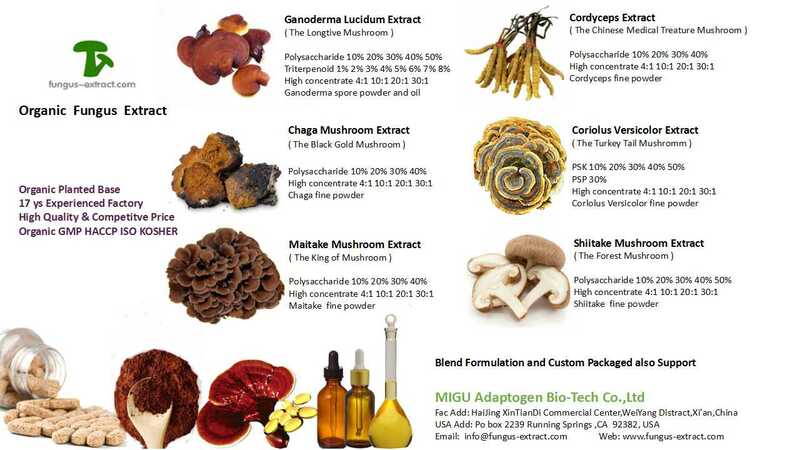 Besides ganoderma spore oil, MIGU Adaptogen Bio-tech Co., Ltd can also supply the ganoderma lucidum spore powder, which is a 100% shell broken powder with very high purity. The powder meets the GMP certification and is safe for the human consumption. Like the spore oil, the powder also promotes health and longevity of the humans. Besides boosting the human immunity, a regular consumption of the powder can prove helpful in controlling hypertension and the blood sugar levels. The spokesperson reveals that they also supply ganoderma spore in capsules, tea and dietary supplements and one can choose the product according to his/her convenience of consumption. Customers can now find Agaricus Blazei Extract in MIGU’s stock. This refined powder is extracted from the fruiting part of this medicinal mushroom. The extract of the mushroom mainly contains polysaccharide and ergosterol, which have strong anti-tumor effect. Besides enhancing the immunity and anti-oxidization of the human body, the extract of this mushroom can also boost cell building of patients after the chemotherapy. It is also found to prevent the growth of tumors and restrict the senility and can also have other health benefits. One can learn more about different medicinal mushroom extract the company can supply by visiting the website http://www.fungus-extract.com. MIGU Adaptogen Bio-tech Co., Ltd is professional fungus extract powder factory certified by cGMP, ISO, HACCP, Kosher, Halal, Organic since 2002. The company is dedicated to the identification, development and production of fungus extract and other botanical extracts. They owned the organic plantation based in ShannXi and JiangSu province to support production of products of high purity and advanced quality. With the strong R&D capability, the company’s lab is equipped with state of the art instruments for testing such as HPLC, UV, UPLC, TT, GC and GC-MS, ICP-MS, GC/LC-MS-MS, HPTLC and IR (identification), ELIASA, Microbiology test and etc.